The single main runway at Campbeltown Airport Scotland is often seriously affected by cross winds making landing hazardous. 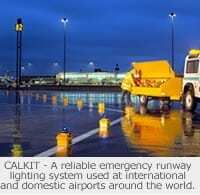 CALKIT™ is deployed by the emergency services to light a short, unlicensed landing strip for Air Ambulance purposes. The system is also deployed at night in adverse weather conditions to train new pilots for short runway landings in bad weather.